Norwegian Cruise Line returned to the Port of Houston for the first time in more than seven years with the arrival of Norwegian Jewel on Saturday, October 11 at the Bayport Cruise Terminal. This inaugural call marked the beginning of the 2014 fall cruise season for Houston. The Norwegian Jewel will sail 27 Western Caribbean cruises through April 11, 2015. 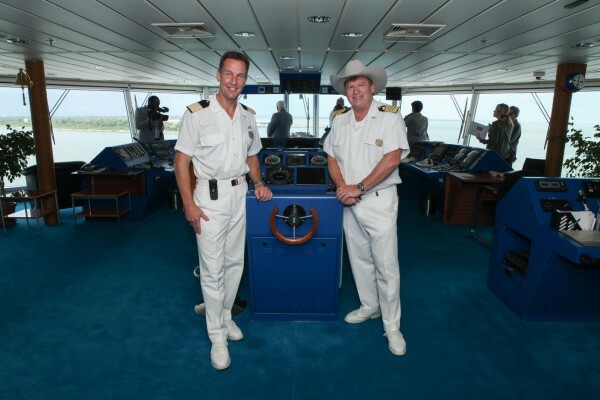 During a ceremony onboard, Norwegian Jewel’s Captain Kenneth Harstrom tipped his new cowboy hat to the great state of Texas, as he welcomed officials from the Port of Houston including Port Commission Chairman Janiece Longoria. On her inaugural voyage, the Jewel will also be the first ship to call at the newest port in the Western Caribbeam in the Bay of Trujilo in Honduras. Other ports of call include Cozumel and Belize City. 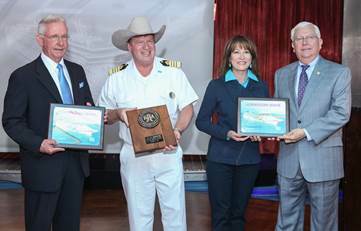 (Photos: Top: From left to Right: Houston Port Authority Commissioner Clyde Fitzgerald joins Norwegian Jewel Captain Kenneth Harstrom, Port Commission Chairman Janiece Longoria and Port Commissioner John Kennedy for a traditional plaque exchange upon the ship’s arrival in Houston on Saturday.